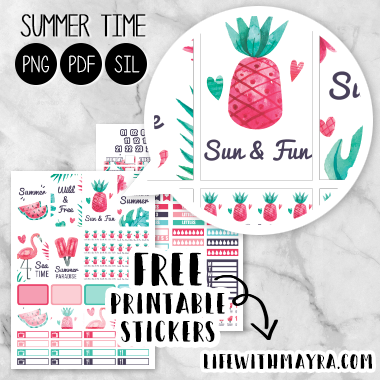 Hey guys, I know I said that my last Summer kit would be my last “Summer” theme of the year but honestly I had to make one more and share it with you guys, I found these really cute images on Freepik and I really wanted to turn them into a sticker set. I also noticed how we still have a few weeks left of summer here, fall doesn’t start until September 22nd. I thought maybe you are still looking for more summer sets so here’s another. I hope you guys enjoy. Remember these printables are for personal use only. If you would like to share these printables with friends please link directly to my blog, and not to the printable file itself. Also check out my Etsy Shop for cute stickers and printables.